To learn what local peer institutions are accomplishing with AV/film digitization, members of the Subcommittee visited National Public Radio's Research, Archives, and Data team, and the preservation labs for audio, video and film collections at the Library of Congress Packard Campus in Culpeper, Virginia and at the National Archives and Records Administration facility in College Park, Maryland. The Subcommittee also provided extensive input into the DPO audiovisual mass digitization pilot project. 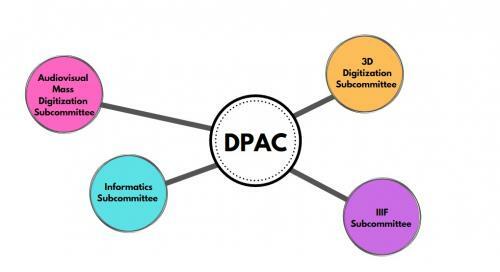 The Subcommittee publicly launched the first Smithsonian 3D Metadata Model, produced by the Subcommittee's 3D metadata working group. DPO currently is gathering community comments on the model for the Subcommittee's consideration. This Subcommittee helped plan for and implement IIIF standards at the Smithsonian and formulated use cases and policy to allow more Smithsonian images available to be engaged with IIIF based tools. This Subcommittee is in formation. A charter has been drafted and circulated to DPAC for comment, and candidates for committee membership are being solicited.